The 2014 and 101st edition of the Grand Boucle (the Tour de France) is only one more sleep away. To continue getting into the spirit I am nerding up on a few books that celebrate the most gruelling sports event in the world (N.B. I don’t want to get into the argument of whether the Giro d’Italia is really the tougher race). Thanks again to my father in law Benny (and the incompetence of international snail mail) I received two books about the Grand Boucle for Christmas. This post is about the second of those two. Richard Moore is one of my favourite cycling sports journalists. The Scottish author is a former top level cyclists himself, and has written several best selling cycling books as well as a book about the infamous Seoul Olympic Games 100m Athletics final and its protagonists. He has regularly written for the big British newspapers on all things cycling and his writing style is excellent (a lot better than mine) backed up by a deep knowledge of the sport of human powered two wheeled racing. The book is broken down into chapters by era from the very start of the history of the event. At the start of each chapter there is a detailed write up of not only the hosting of the race, but it also captures some of the drama and incidents. This again is all painted against the backdrop of the changes in French society. My favourite photo is one where one of the riders is changing his own tyre on the roadside (at the time the riders were not able to have external assistance) and standing alongside looking on is a mother holding her young infant looking on – not so much about racing but about a race that is never too far away from the people. A big bonus is the inclusion of some of the vintage photos from the early days of the tour. These are fantastic and it must have been tough riding in those conditions. The photography in this book is superb but just as good is the editing that has gone into choosing the images that communicate the story. This image of “The Cannibal” (Eddy Merckx) is iconic, and you can see the steely determination in his eyes. The book provides equal photographic focus on all the key protagonists in each era, which is something that the previous book that I reviewed did not. And it is not just the champions who are in focus, because the race is also very much about the guys who finished second… that maybe in another time would have been on the top step. It is these racers who often pushed the champions to greatness. 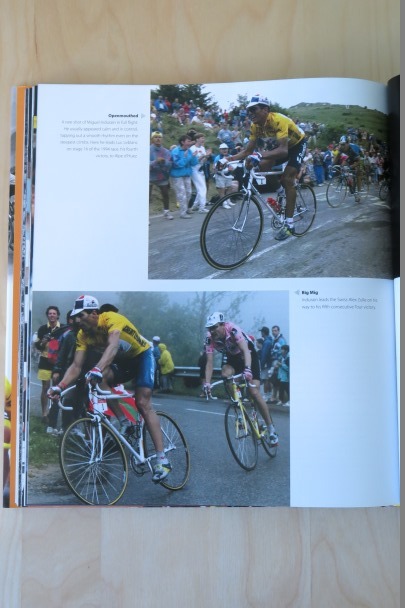 Here is Big Mig (Miguel Indurain) in action leading in front of Luc Leblanc and Alex Zulle respectively – both great riders in their own right, they just came across the giant of a Spaniard. 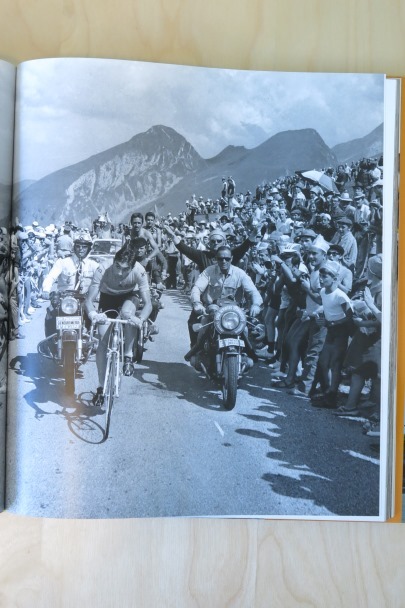 The book treats the EPO doping years in a much different fashion. It recognises that these guys in the peloton were still the best riders in the world, but it doesn’t shy away from the smear that befell the sport. I still look at this as a real shame, rampant drug use at the top level just when the sport was about to explode. This book has an elegance and style to it that the previous book did not. 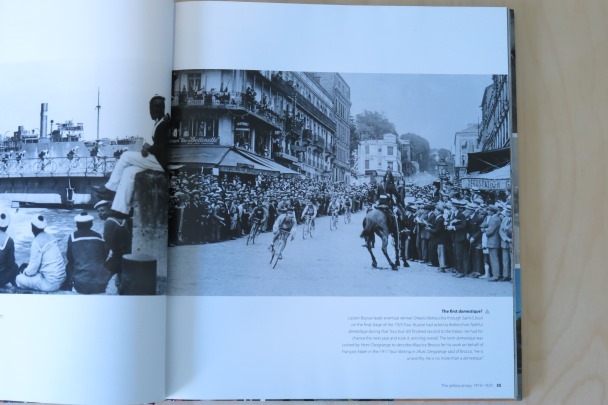 I will pick it up again and again just to gawk at the stunning photography and point me to where I should further research the history of the Grand Boucle. 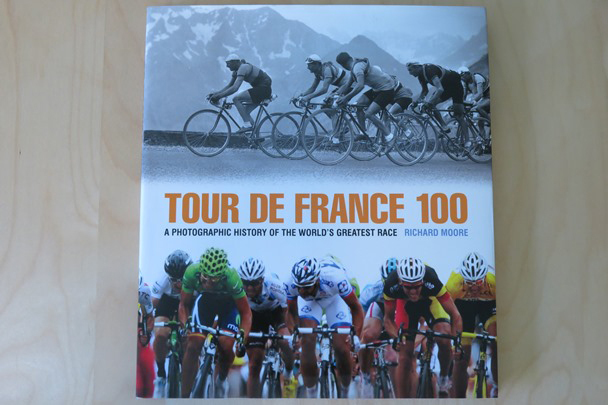 I give this book 5 cranks out of 5 – an excellent read and a real photography gem. Are you in a Tour Fantasy league? Yeah, our host broadcaster runs a good one for free. Search for sbs.com.au tdf fantasy. If you register I send you the league details.